Are you interested in living on campus in a community with other Wright State new transfer students? 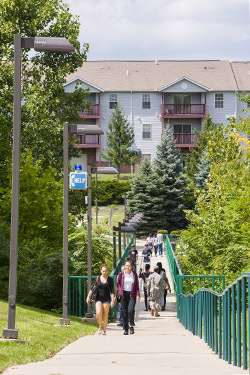 Wright State has three great campus housing options for you to choose from where you will have nothing short of the best campus life experience while living in a community with other transfer students at Wright State! The transfer community will give you the opportunity to establish a social network with transfer students and other Wright State students. Together, you will have the best college experience ever! Select "Continue to My Housing Account"
You are now on the Housing Account Landing Page. If applying for housing, click the Apply Now button. If you have roommate request(s), you will need to have their name and UID (University ID) to enter on the application preferences. If you have forgotten your UID and PIN, but know your "w" login, you may go to WINGS and click on the WINGS Express button in the top right corner. If you need assistance logging in, contact the Help Desk at (937) 775-4827.